What makes a car? The engineering or the badge? The latest MINI One provides no immediate answer to the question. The car traces its lineage to the original Mini produced by the now defunct British Motor Corporation and its successors from 1956 to 2000. But it has ceased to be British since 2000 after German motoring giant BMW took ownership of the brand. The car reviewed here is the facelifted third-generation model that was launched in 2014. Facelifts of the cars in the MINI stable are often the hardest to spot. 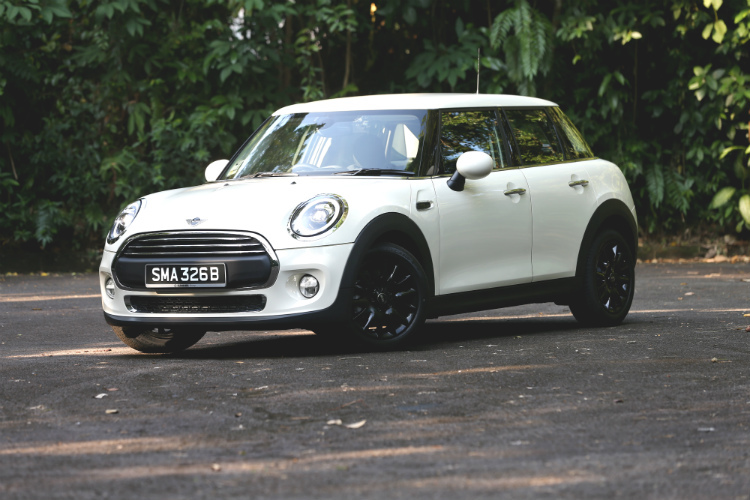 The updated MINI One is no exception. There are no changes to the car’s physical dimensions or its design. One can argue that the car already looks so stylish and cute that nothing can be done to make it look better. The main changes are the lights – There are redesigned LED headlights and tail-lights. The headlights are rounder than the ones on the predecessor, but few will notice the difference. The changes to the rear lights are more pronounced. When lit, they resemble the Union Jack. 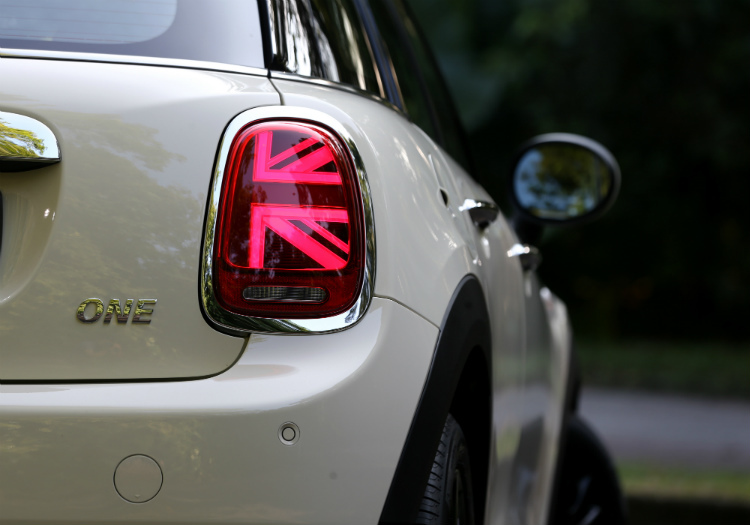 They are arguably the most distinctive and striking rear lights in a production car today and only MINI with its British roots can pull off. Like its predecessor, the engine is still a turbocharged 3-cylinder, but it gets a capacity boost from 1.2 litres to 1.5 litres. This means higher torque (190Nm versus 180Nm), but oddly, there is no bump in horsepower. The MINI One now gets a 7-speed dual-clutch gearbox, an upgrade from its predecessor’s 6-speed automatic. Both the engine and gearboxes are also used in other BMW cars. 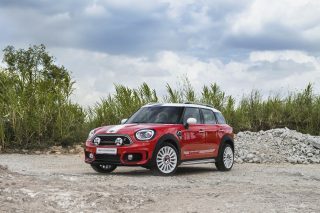 The refreshed MINI One gets three new metallic colours – Emerald Grey, Starlight Blue and Solaris Orange – and a standard set of piano-black 16-inch rims. 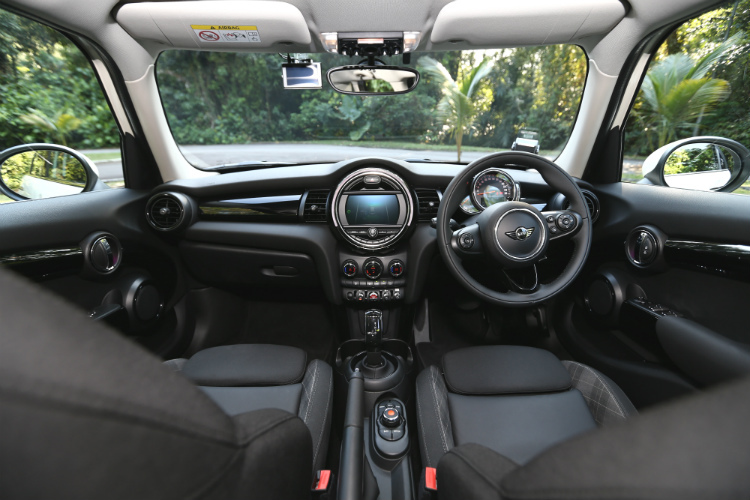 Inside the cabin, the car gets new leather trims and a redesigned three-spoke steering wheel with the usual controls for audio and phone. On the move, the car retains all the driving characteristics that its predecessors are known for. The drivetrain is eager and lively. The car is not exactly fast but it is fun to drive. It comes with three pre-set driving profiles. But instead of plainly labelling them as sport, normal and eco modes, they are now known as Sport, Mid and Green. These modes, however, do not tweak the suspension of the car, so it is basically using software to vary aspects like gearshifts and power delivery, like in a computer game. On expressways, the car feels rather normal. But it shows its full elements around bendy roads. It hugs the curves at Old Upper Thomson Road with minimum body roll. The communicative and direct steering makes the car a joy to pilot there, even at low and moderate speeds. The test car is one of the two entry-level MINIs – the other is the three-door variant, which is $3000 less. Its equipment level is respectable for an entry-level car. It has a 6.5-inch infotainment screen that comes with the usual Bluetooth features for audio and smartphones, but there is no built-in navigation. There is keyless ignition, but you still need to press the key fob to lock and unlock the car. There is no reverse camera to aid parking, but this feature will not be missed because the car is compact and easy to park to begin with. There is a feature that brought an instant smile. When I pressed the key fob to open the car, the MINI logo is projected on the floor in front of the door. I drove the car at night after it rained and the light warned me of a puddle of water. The feature is both classy and practical. 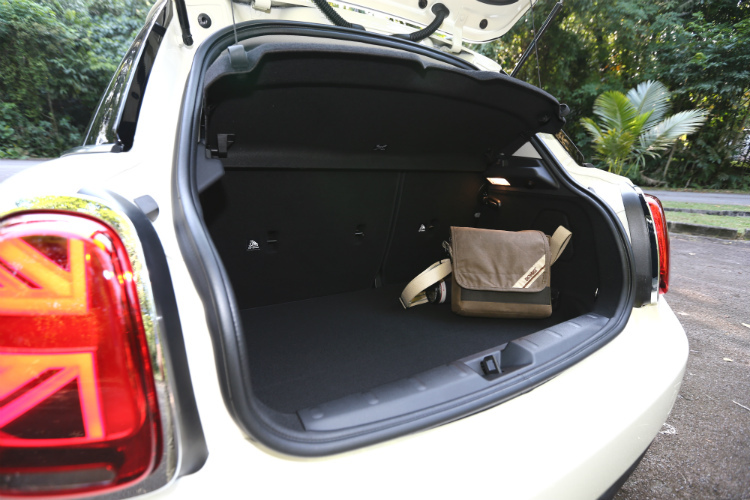 Another practical aspect of the MINI One is the boot. While it is not massive, it is sufficient for daily uses like sports bags or groceries. With the seats folded down, I was even able to transport a full-sized, high-back office chair for a colleague. The only niggle I have with the MINI One is the relatively high fuel consumption. Over a three-day, 240km test drive, I achieved about 10.3km per litre of petrol, nearly half the official figure. It must be because I drove about 80 per cent of the time in Sport mode. As a hatchback, the MINI One 5-Door is as iconic as the Volkswagen Golf. Price-wise, the entry level MINI One costs about the same as the mid-range 1.4-litre Golf, which means that those thinking of buying the Golf ought to take a look at the MINI One. 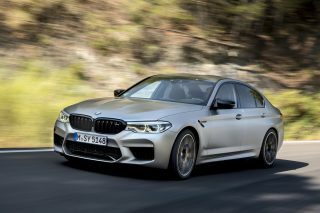 But what makes the car appealing is that it is has a BMW engine and a BMW gearbox, but costs nearly $20,000 less than an entry-level BMW 1 Series hatchback. It may not have the BMW badge, but it has BMW engineering at its core wrapped by the unmistakable chicness of MINI sheet metal. The MINI One has the best of everything: design and performance packed into a bundle at a price that does not break the bank.